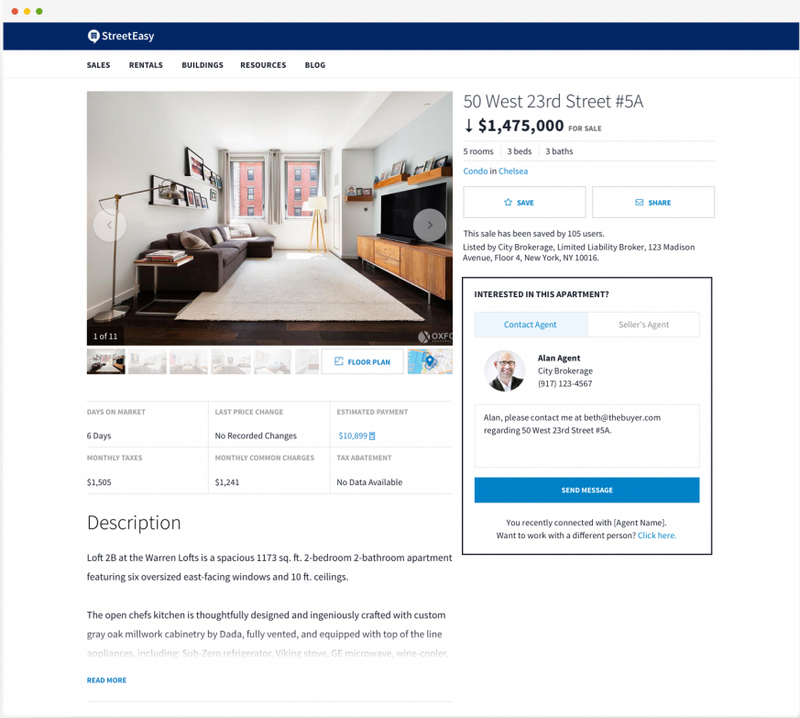 One of Zillow Group’s new marquee features for its Premier Agent program is now coming to its New York City home search subsidiary StreetEasy. “My Agent,” is a feature that Zillow first rolled out for its namesake portal and subsidiary Trulia earlier this year. It lets Premier Agent customers send invitations directly to buyers to become their go-to agent and guide throughout the home search process. If a buyer accepts, they’ll see the Premier Agent and their contact information in a box marked “Contact Agent” across all subsequent listings they see, below the listing agent. Another feature called “Client Insights,” which lets Premier Agents see a buyer’s home search history and get other information about them, is restricted to Trulia and Zillow for now, a Zillow spokesperson told Inman. However, as the StreetEasy team notes in a blog post about the feature “this program by no means constitutes a contract between you and the agent,” and home searchers can cancel their connection with the agent at any time. Also mindful of the New York Department of State’s ongoing scrutiny over online advertising disclosure, StreetEasy says that it will “use onsite and in-app messaging to make sure the buyer knows that the Premier Agent they are talking to is a buyer’s agent,” rather than the listing agent/seller’s agent for any particular property, according to The Real Deal. The new feature should help Premier Agents in the NYC area take advantage of more that StreetEasy and parent company Zillow have to offer through the program. Correction: This piece originally stated that the Client Insights feature would be available on StreetEasy, but it is not presently. We’ve since updated the story accordingly and regret the error.